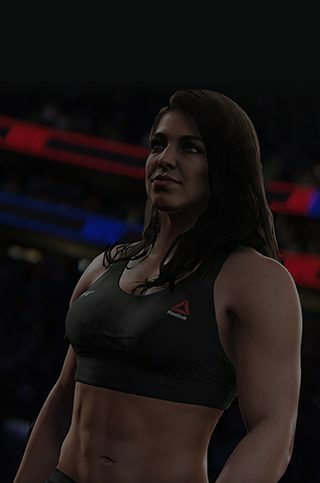 Mackenzie Dern and Alex Hernandez are being added to the UFC 3 roster in Content Update #10. 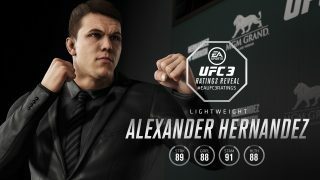 Two extremely promising prospects are debuting in UFC 3, as Mackenzie Dern and Alex Hernandez are added to the roster. Get in the game today and take these fighters to new heights in your favorite game modes as you write your own story. Along with additions and improvements in Gameplay Update #10, you'll be ready to take on all challengers in UFC 3. Mackenzie Dern: A Brazilian Jiu-Jitsu black belt with multiple wins in international tournaments, Mackenzie Dern brings a grappling rating of 92 that can end fights at any moment. Her undefeated mixed martial arts record of 7–0 includes four finishes by submission, a promising start for this 25-year old prospect. Go after the belt with Dern today. Alex Hernandez: Bursting onto the scene at UFC 222 with a 42-second knockout win over Beneil Dariush, Alex Hernandez boasts a professional record of 10-1 with the potential to turn into something special. His striking rating of 89 combined with 91 stamina makes him a well-rounded competitor who's always comfortable on his feet. Finish the competition with Hernandez's thorough skillset. Fresh prospects and gameplay changes are regularly being made in EA SPORTS UFC 3, bringing you a dynamic experience that's always evolving. See Gameplay Update #10 for full details on all the latest in game additions to UFC 3. Stay up to speed with UFC 3 on Facebook, Twitter, and Instagram. Get your copy of UFC 3 today, and journey to be the greatest of all time, inside and outside the Octagon. Sign up today to receive the latest UFC 3 news, updates, behind-the-scenes content, exclusive offers, and more (including other EA news, products, events, and promotions) by email.